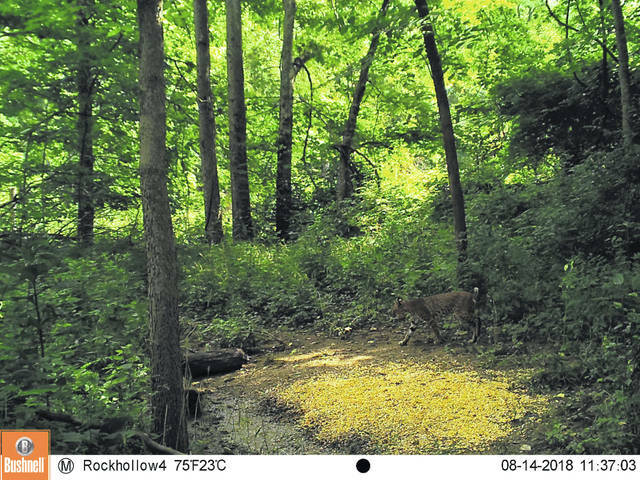 Wildlife Officer Jeff Tipton recently received two reports of bobcat sightings in Champaign County, including the one captured in this photo. Bobcat is in the lower right quadrant of the frame. Rumor has it that there was a bobcat spotted in Champaign County. Well, you know how rumors are, they can’t usually be trusted, but in this case it’s true. In fact, I’ve recently received two separate reports of bobcat(s) in Western-Champaign County near Kiser Lake State Park. The reports came from local hunters that had pictures of them on their trail camera. As far as I know, in recent history, these are the first and only reports of a bobcat(s) being in Champaign County. When the most recent report came out it was posted on social media and there were a lot of views and quite a few people that were concerned about the presence of a wild cat. So, I thought that this would be a great opportunity to educate folks about bobcats in Ohio and to hopefully help alleviate any fears. In general, bobcats are small, being only about twice the size of an average house cat. They are reclusive, so seeing one in the wild is rare because they prefer to avoid people at all costs. Their presence is usually unseen until they are caught by hunters on trail cameras. They’ve been in Ohio for many years, mostly in Eastern and Southeastern Ohio, and in that time there haven’t been any documented cases of bobcat-to-human conflict. So, with that being said, the fact that a bobcat has been spotted in Champaign County is not of great concern to humans. In fact, it is kind of cool to know that they’re here. • Bobcats made their way back to Ohio from surrounding states. Their overall range includes much of the U.S., northern Mexico, and southern Canada. • In April 2014, the bobcat was removed from Ohio’s list of threatened species and is now often seen, especially in southeastern counties. • Since 1970, there have been 2,025 verified reports of bobcats in 71 Ohio counties, the majority of which have occurred since 2000. Overall, verified sightings have increased steadily over the past decade; there were 499 verified bobcat reports in 2017 from 46 counties. If you observe a bobcat in the wild, enjoy it from a distance, just as you should when encountering any wild animal. If you see one or catch one on trail camera please be sure to report it by copying and pasting the following into your web browser: http://wildlife.ohiodnr.gov/species-and-habitats/report-wildlife-sightings to report the sighting. To learn more about bobcats in Ohio go to wildohio.gov.